[Images: Rosslyn Chapel, container of symphonies]. I meant to post this ages ago – at the beginning of the summer – but it slipped right by... So this isn't exactly news, but I still love it: Scotland's Rosslyn Chapel, world famous for its appearance in Dan Brown's The Da Vinci Code, has apparently been hiding a fascinating secret, after all. It turns out that "[a] father and son who became fascinated by symbols carved into the chapel’s arches say they have deciphered a musical score encrypted in them." [Image: The intricate ceilingry of Rosslyn Chapel, photographed by Benjamin Lee; via Sacred Destinations]. From the website of Thomas J. Mitchell, who "decrypted" the music: "Rosslyn Chapel holds a musical mystery in its architecture and design. 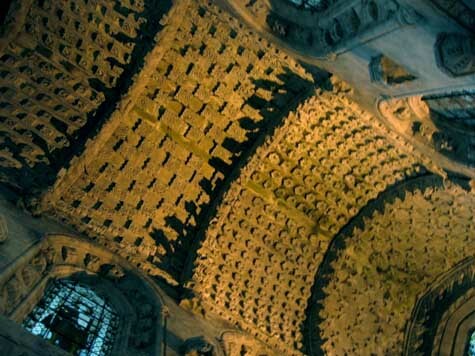 At one end of the chapel, on the ceiling are 4 cross-sections of arches containing elaborate symbolic designs on each array of cubes (in actual fact they are rectangles mostly). The 'cubes' are attached to the arches in a musically sequential way." In the over-ambitious application of a cryogenics metaphor, Mitchell says that the music has now "thawed out" to be understood – and heard – by people today. Being a composer, he also seems to have released the music on CD. 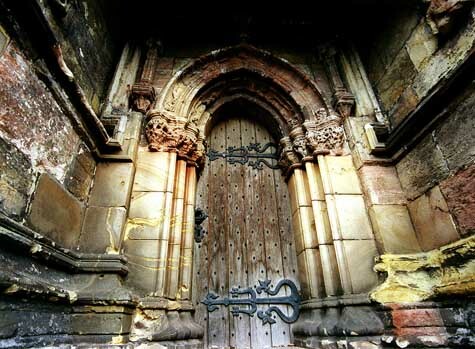 [Image: The Rosslyn Chapel doorway, photographed by seth + lara m.; via Sacred Destinations]. Whether or not there really is music encoded in the arches of Rosslyn, the implications of this are exciting. Will someone detect, for instance, a thousand years from now, a symphony encoded in the runways at Heathrow? Or will the New York City subway system be reunderstood as a series of sub-terrestrial folk songs, themed around a chorus of transportation? Or perhaps the International Space Station will be revealed after all as an étude of pressurized air tanks, awaiting its musical decryption; it is three-dimensional music, hovering in space. whether the origanal builders ment it or not this is an interesting way to assess a building. i propose we do it with modernday buildings. but screw using haunting pianos and violins, the peices shall be proformed by metal bands. this sounds exactly like something that NIN or tool would do anyway. why does everything have to be classical instruments when it comes to anciant or medival things. there were no pianos back then anyway. i love classical music but i think that the cruchy sound of an electric guitar maybe more fitting for for dark ages. Have you seen the tin can they have on top of Rosslyn these days? If nothing else the music of rain falling while standing close under the hard tarpaulin within a framework of scaffolding over a wildly colourful ancient sandstone enigma is poetry in itself. Hmm, well music is closely related to mathematics so they may simply be finding some pattern which coincidentally relates to music but is more a result of some scheme being followed by the original builders. Leaving aside Dan Brown (and Fulcanelli), medieval churches and cathedrals were intended to be "read" by an illiterate populace. Every detail of the building would have been scrutinised for its latent meaning so I tend to be sceptical when people claim that great mysteries were "hidden" in plain sight. For more interesting music in churches, German electronic group Tangerine Dream played a series of concerts in European cathedrals in the 1970s. One of these, the Rheims concert, is widely available as a high-quality officially-sanctioned bootleg. This is a lot more than interpreting the architecture in a musical fashion. This gentleman actually decoded the architectural embellishments, and halfway through the project, got clues from the Chapel itself that he was on the right track. Read more about it here, including a link to a video explaining the science of cymatics.